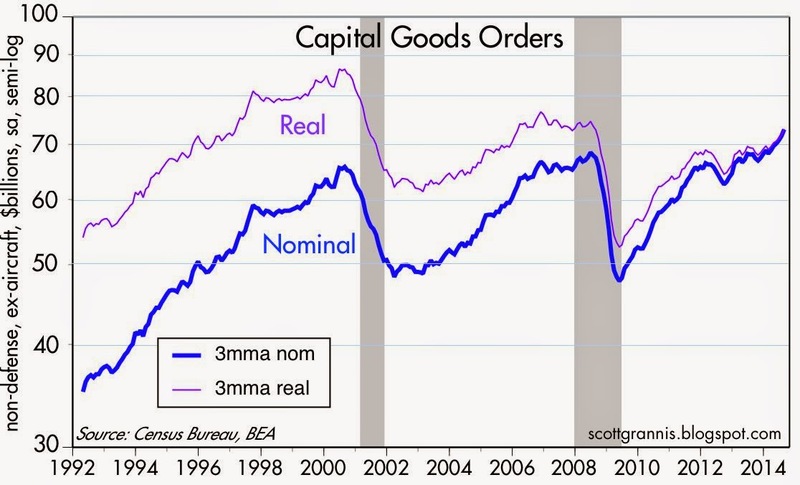 After being relatively flat for most of 2013, capital goods orders—a good proxy for business investment—have rebounded strongly this year. Today we learned that August orders exceeded expectations (+0.6% vs. +0.4%), and the decline in July orders was revised down from -0.5% to just -0.2%. On a year over year basis, orders rose 7.5% through August. This series suffers from a mysteriously deficient seasonal adjustment which can be largely corrected by looking at the 3-mo. moving average, which I've shown in the chart above. Using the smoothed series, we find that the 6-mo. annualized gain in orders is a very impressive 14.5%. Inflation-adjusted orders are still about 15% below their 2000 high, but they are closing in on their pre-recession high. Thus, while the level of orders is still disappointing, the change on the margin is quite encouraging, and that's what matters the most to markets and the economy. Business confidence has picked up this year, with the result that today's new investment in capital goods should lead to increased worker productivity and somewhat faster real growth in the months and years to come. We see the same picture in Commercial & Industrial Loans, which are a good proxy for bank lending to small and medium-sized businesses. 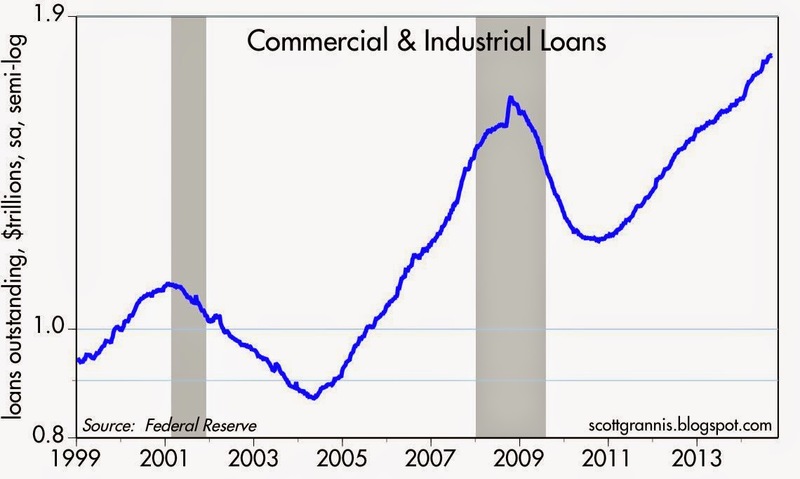 As the chart above shows, the growth rate of C&I Loans picked up starting last January. Since mid-January, loans are up at a 14% annualized rate. This reflects a significant improvement in confidence on the part of banks and businesses (banks more willing to lend, businesses more willing to borrow). These—increased confidence, increased lending, increased investment—are the undercurrents which are causing the economic outlook to improve, validating the equity market's gains, and driving note and bond yields higher. Good numbers...still, would like to see a 1990s economy again.